This is a bit of an unusual post because it's something I can't work out so I need your help ! 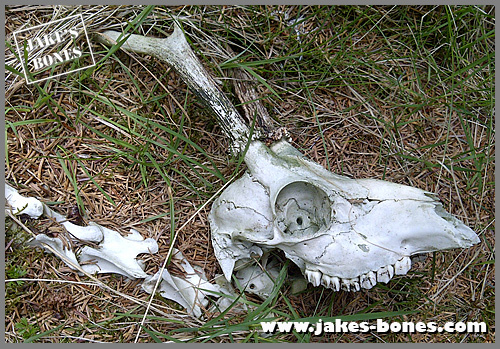 A couple of weeks ago dad was stalking the red deer in Suicides Graves wood and he found this skull in the valley near what I call Jake's Island. It was an incomplete young adult roe deer buck lying int he grass near the edge of trees, but what was more interesting was this unusual mark on the top of the braincase. What could have caused this ? This is the back of the skull behind the left pedicle (the bit of bone that the antler grows out of). 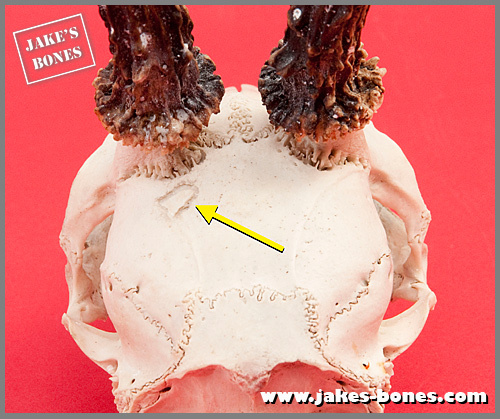 It looks like an irregular circular shape where there is a thin groove into the bone on the braincase. This is how the skull looked when dad found it. 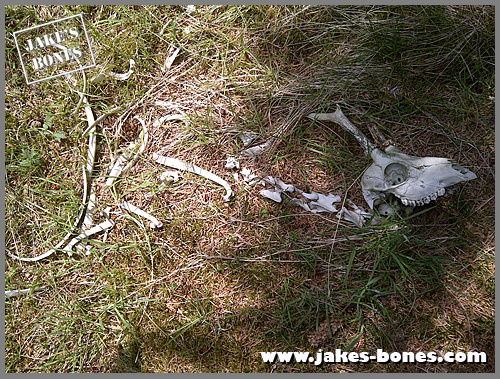 There wasn't much of the skeleton, but the ribs, spine and neck bones were in the right order where the deer had lay. Dad looked around and found some of the legs bones but couldn't find the lower jaws. 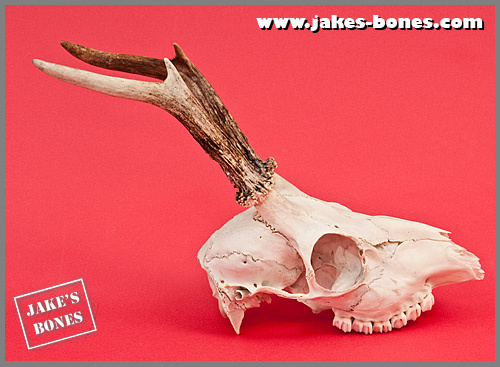 The easy thing was that it was an adult (all six cheek teeth were through), it was a roe deer (duh), it was a male (only male roe deer have antlers), it died some time between March and November (because the antlers were finished growing) and it was a young adult (the teeth weren't too worn, the antlers look like a second set, and the two cracks between the spine hole and the nose underneath haven't properly fused yet). I think it was probably aged between two and four years old. 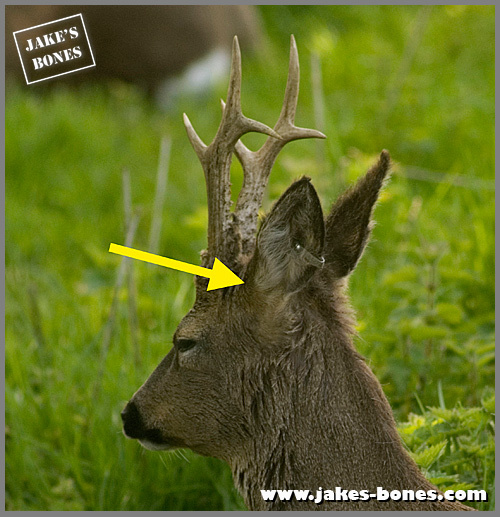 The antlers aren't 'perfect' either, because full roe deer antlers have three tines (spikes) not two (but I have one that has four spikes). 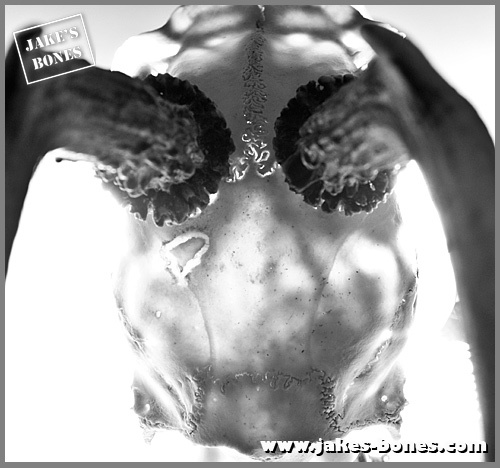 I have never seen anything like the unusual mark on the braincase before, but I have five theories about what might have happened. My theory: There was an injury which caused this bit of bone to become detached and broken from the rest of the braincase, but it was held in place by the skin on one side and brain on the other and it managed to stay in place and regrow to rejoin the rest of the skull. For: It looks a bit like an irregular break which rehealed. Against: It would be an unusual place to get an injury, right on top of the head of an animal which is the second biggest animal in that wood (after red deer). It would be an unusual to survive such an injury without infection or damage. This theory is the same as the first one, except something went through the skull creating a hole, and the bone over the whole hole has grown back. Against: I shone a strong light through the skull to show the thickness of the bone. (a bit like how an x-ray works but not really). The bone on the unusual bit seems the same thickness as the bit opposite (apart from the groove which shows as white). If bone had grown back you might expect it to be thicker here or more uneven. Also, if bone had grown back over a hole, I would expect it to grow from the edges, not the middle. It would also be even more amazing for an animal to survive a hole in the braincase. 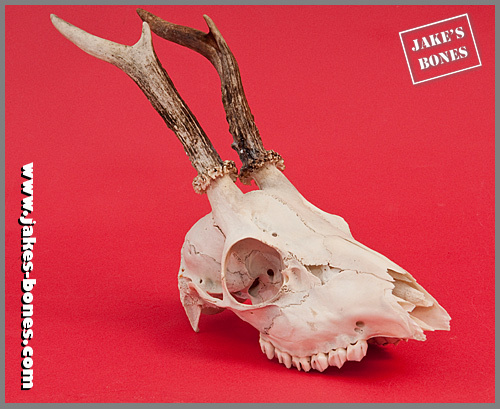 Elsewhere on skulls you can see tiny lines caused by blood vessels, scent glands and so on. What if this was something on the soft tissue that the bone grew around, like a blister or a scar ? For: It would be the right size for something non-life threatening, and is irregular. It looks more like something was taken out of the bone (or the bone didn't grow) rather than an injury which grew back. Against: Do blisters or other growths on the soft tissue cause grooves like this ? Maybe this was caused after the animal died. 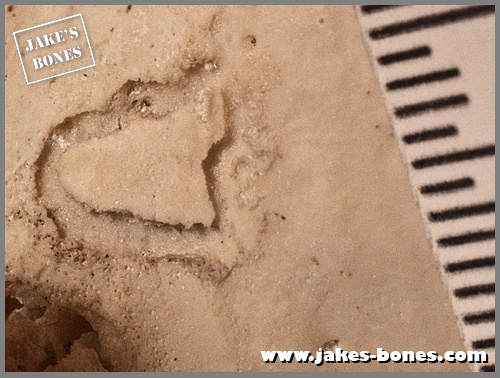 It doesn't look like a tooth or claw mark, though, and the skull wasn't disturbed from when the animal had died. Are there any insects that could do this ? 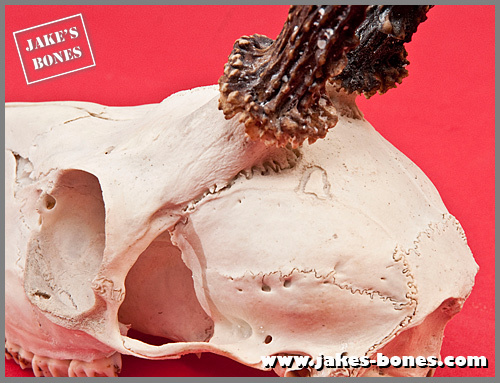 For: It would explain why it looks like the bone had been eaten away from the outside. Against: I have never seen this before, and why would the insect or bug eat in a circle ? 5. It was from an ear muscle. There are three muscles which are used to turn the outer ear, and I think these are attached to the skull. What if one of the muscles was pulled hard after death ? Could this have damaged the skull ? For: It is sort of in the right place. Against: I think it is unlikely to damage the skull in this way, and I have never seen this injury before. Do muscles attach in a ring ? I think they attach in one spot. So what do you think ? What else could have caused it ? 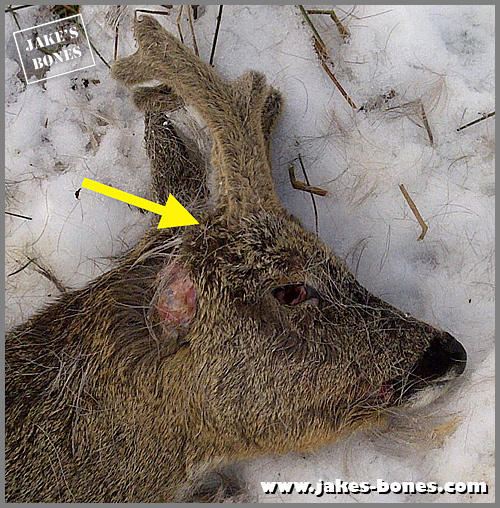 What is the story of this roe buck's life ? Put your theory in the comments below ! I wonder if it might be some kind of parasite, Jake? There is a cool nematode worm named Skrjabingylus nasicola which lives in the sinus cavities of weasels and causes dramatic bone damage (see a paper at http://onlinelibrary.wiley.com/doi/10.1111/j.1469-7998.1977.tb04157.x/abstract and a photo of one of my own skulls at http://www.flickr.com/photos/smg_skullboy/7999275970/in/set-72157631565215371 ... Obviously this damage is not within the sinus cavity but I wonder if something else may affect the surface of the cranium? You get ones which go inside deer noses as well. But why would it go round in a circle ? Hi Jake, I think that this damage may have been caused by a Dermestid beetle. It looks like the kind of damage that occurs if you leave a bone in a Dermestarium for too long and the beetle larvae have cleaned all the meat off and only have bone left to eat. Did a horrible crime happen in this wood ?